Woodson Terrace, Missouri became a city in 1946 and has grown over the years to be a great place to live, work and shop. Our city has a 17 member Police Department which provides 24-hour protection to our residents and businesses. We also have a full time Public Works Dept. and a full time staff at City Hall to serve residents during normal business hours. We are located just west of St. Louis off I-70 (across from Lambert International Airport). Our city has been rated as one of the safest areas in Missouri to live. We have two lovely parks, one with a pool, four strip malls, 125 businesses, several major hotels and dining facilities and we are within walking distance to the airport. Woodson Terrace offers several business and residential properties for sale, lease or rent. If you would like additional information about the City of Woodson Terrace, drop me a note. 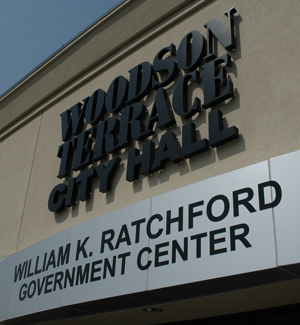 The City of Woodson Terrace Board of Aldermen meets on the third Thursday of each month at 7 P.M. The public is welcome to attend. All meetings are held at City Hall.